Under the Desert Sky by Sara Luck is a historical romance set in the Arizona frontier. It offers a standalone fade to black romance with a strong heroine, suspense and ostriches. 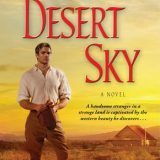 Well-paced with interesting character and a picturesque setting I quickly devoured Under the Desert Sky.